Director Steven Hoover tells Aseem Chhabra about his award-winning film, Blood Brother, a documentary on Rocky Braat and his extraordinary relationship with HIV-positive children in a Tamil Nadu orphanage. Until a few years ago, Rocky Braat, a native of Pittsburgh in the USA, was searching for the meaning of life. It was perhaps this quest that brought Braat to India and then led him to an orphanage in Tamil Nadu where he met HIV-infected kids. At the orphanage, Braat, 31, immediately connected with the children and suddenly found a purpose in life. 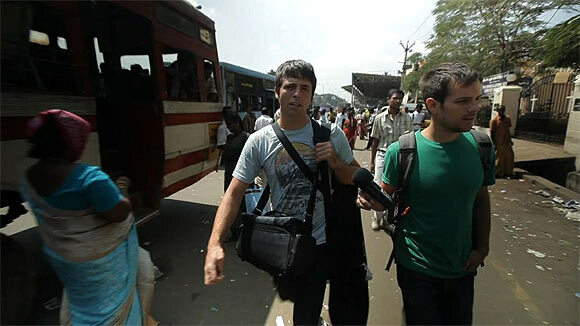 He also managed to convince his Pittsburghian friend Steven Hoover, who was looking to make his first documentary film, to take a trip to India and meet the children. Hoover's documentary Blood Brother is a heartwarming tale of a man from a very different social, economic and cultural background finding a connection with those who the society has nearly abandoned. The kids get decent care at the orphanage, but the brotherly love they get from Braat is stuff we rarely witness in real life. Braat's love for the children makes Blood Brother one of the most uplifting and significant documentaries that examines the human spirit. Braat eventually decided to marry a local woman and settle down near the orphanage (the exact location of the orphanage, the name of the village is not revealed in the film for the protection of the children and Braat himself). Last month, Hoover's documentary won both the grand jury prize for documentary and the audience award at the Sundance Film Festival. Hoover, 30, recently spoke to Aseem Chhabra from Santa Barbara where he was about to show the film at the city's international film festival. Steve, how long have you known Rocky? I have known him since 2001. We met in Pittsburgh. We went to the same college -- the Art Institute of Pittsburgh. He moved in across the hall from me and one day he introduced himself to me while I was waiting for the elevator. We have been friends ever since. We quickly became roommates. We lived together for seven years and the month I got married, that's when he moved to India. So he went to India just for the fun of it and then landed at the orphanage. When did he return to Pittsburgh and how had he changed? When he returned to Pittsburgh after a three-month trip to India, he had bought a one-way ticket. He came back and stayed here for a year and then went back in 2009 until the end of 2010. He thought he was moving there for good, but he was battling visa issues. India had just passed the law that people had to leave for two months after their visa expired. In the film we see he is restless when he comes back from India. Could you sense what was going on? It was quite emotional. He was restless here, because he wanted to be in India. He felt protective of the kids and was always looking out at their best interest. The kids were in good hands. It is a good orphanage, but he wanted much more for them, to help them emotionally. So when he was away, it was difficult for him. He didn't want to leave, but he had to. Rocky is a very nostalgic kind of guy. When he came back to Pittsburgh, people had moved on. And he spent a lot of time doing nothing. In India he Is always busy doing things that are meaningful and effective. How did he convince you to come along and when did you decide this could be a film? He had been inviting me all along after his first trip. I never pursued it. But I always wanted to make a documentary in a developing Third World setting. And I didn't know what that meant. Rocky would send e-mails about things he would experience ranging from really funny to challenging scenarios. And he kept asking me to visit. So finally I mentioned to him about the dream I had of doing the documentary and talked to him about the idea of the film. Were you able to raise enough money? I get a sense that you had a crew with you. On our first trip we had a crew of six people. We were able to raise the money to have that many people over for filming. Most of us who worked on the film are from a production house in Pittsburgh where we make music videos and do editing work. The second trip was self-funded and I went alone because we ran out of money. During the first trip you were in a large group. You landed there and saw Rocky in his elements, in surroundings he was very comfortable in. What did you think of the whole situation -- the orphanage, the children who were all HIV positive? Getting there was very surprising. I took a lot of comfort in knowing what he was doing and seeing him comfortable, because I was not. There was a lot of dependence on him to help me understand things and guide me. I definitely looked up to him and followed his lead a lot. It was really amazing to see he lives there. He was very much a part of everyday life in this village. You talk about your discomfort in the film and it had to do more with the fact that the kids were HIV positive, right? Everything was brand new. I had never been to any place like that. I was uncomfortable on all levels, but a lot of stuff was easy to adapt to. Okay, I am in a village and I am going to sleep on the concrete floor, even though there might be bugs and rats. It was more difficult to overcome the stigma of HIV, my personal fears. I was educated on it, I understood how it is transmitted and Rocky helped prepare me for the situation. But the stigma of HIV is very strong, especially when you encounter it for the very first time in your life. That took a little bit more time to get over. At what stage did you decide to incorporate your voiceover narrative in the film? It seems that the film was supposed to be about Rocky in this orphanage with the kids. But then it becomes your story and re-discovering your friend. What I liked in your story was that Rocky is an insider, but you are the outsider, like the audience. It was later in the process. There were different things I wanted -- to go along for the ride, to share the journey. I wasn't a part of the story in the first edit. The good thing is that while I was there I did a lot of recording my thoughts, emotions about what I witnessed, each day. When I saw the first edit I noticed a disconnect and realised that pieces of my story needed to be there. The film begins on a positive note with Rocky playing with the kids. But then the film slowly starts to become terribly sad, as the kids start to fall ill and die. Were those editing choices you made in order to narrate the story? Everything happened chronologically. Rocky's emotions in the beginning when he was joyful and bubbly -- that's how it was when we got there. It was fun, it was exciting. But when Vemathi (a young girl who lived in the village and often visited the orphanage) died, that was a major turning point for everybody -- Rocky and even the kids. The kids usually responded to Rocky. Everything began to change emotionally and we realised that it wasn't all fun and games, because the lives of these kids were changing. Rocky's spirit was crushed. His idealism was challenged. We had no idea that Vemathi was going to die. From the time Vemathi died to when Surya survived in the hospital -- we see the trying six months for Rocky. And amazingly it fit the narrative structure of a film. The footage you have of Rocky taking care of Surya in the hospital reminded me of Mother Teresa. You have known this guy for over 10 years. What were your thoughts when you saw him doing that? I thought it was very beautiful. As I say in the film, I was naturally repelled. And then there was a tension in me, how could I react like that to a child. It is difficult when you see open wounds and you know the power of HIV. It was frightening to see someone overcoming that stigma. It was very powerful for me to witness that. I had tremendous respect for Rocky as he was doing that. He was just very steadfast in taking care of this boy. I would have given up. I would have stopped at some point. But Rocky was relentless. Do you think it had to do with the fact that he did not get much love as a child? Because he didn't have a father around, perhaps he was being a father to these children? It's tough to say exactly, but I would guess that played into it. That's why I tried to explore his past to try to understand why he acted the way he acted. He had invested so much in this family of his -- not just Surya, but also the other kids. This is what you do for your family and people we love. Rocky was with you in Sundance. Is he back in India? And what does his wife do? He is actually in Pittsburgh working on his PIO (Person of Indian Origin) card, since his wife is Indian. He is trying to get back as soon as he can. He is not employed at present. He just volunteers all his time at the orphanage and lives off donations. All the money we make from the film will go to HIV AIDS initiatives in India and part of the money will help support Rocky so he doesn't have to beg for donations anymore. His wife Nimmy (Nirmala) works for the organisation. She doesn't make much money, but every night she tutors the kids. How did the film change you, especially now that it has received acclaim at Sundance? I am still trying to process some of the stuff. I feel great about a lot of decisions we made about the film and that we are giving all the profit away. That was the right thing to do. There are people out there who need this support. I realise that I could use the talents I have to help people who can't help themselves. There are many people who want to help as well. Now that the film is over, do you still think about the kids? Oh yes, I just went to India with my wife. We spent time with Rocky, Nimmy and the kids. We also travelled to some other orphanages. I think about the kids all the time. They have seen the film. They loved it, but some of them found it tough to watch. But they were very thankful for it. And Surya, he loved it, man. He felt like a rockstar. You know, how Indians love their cinema. Well, he felt like a hero.